After a long series of intergovernmental negotiations on various themes,which saw a broad participation from major groups and civil society stakeholders under the guidance of the United Nations State Members, the Goals have been adopted on September 25th at the New York United Nations Summit by 193 Member States. In the same occasion, the UN launched their post-2015 development agenda, in which the Goals are integrated. UN Member States, the civil society and private sector contributors will use this new, universal set of goals, targets and indicators to guide development global efforts over the next 15 years in a concerted international action within the broadest, most ambitious development agenda ever agreed at the global level. The 17 Goals and 169 Targets are meant to be action-oriented, concise and easy to communicate, aspirational, global in nature and universally applicable to all countries, while taking into account the different national realities, capacities and levels of development and respecting national policies and priorities. The Foundation for Environmental Education with its global network thus needs to frame and highlight its role as a stakeholder and trendsetter in the Sustainable Development process, particularly for environmental, educational and eco-tourism matters. The SDGs will define a relevant part of the context within which FEE operates, thus we are driven to reflect our work in the Goals. 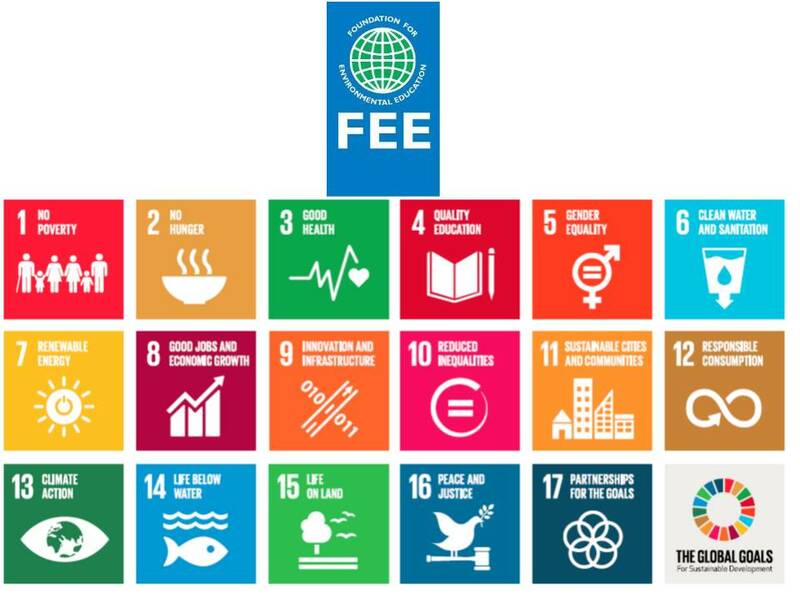 FEE through its mission of fostering awareness, knowledge, participation, commitment, skills, actions and creativity on the environment and on sustainable development, shares the core values behind the set of SDGs. The programmes based on Education for Sustainable Development, such as YRE, Eco-Schools and LEAF show a strong link with the educational Goal (SDG 4) and the Goal on global partnership for sustainable development (SDG 17). 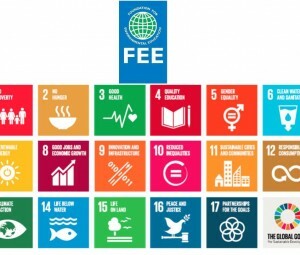 FEE’s tourism eco-labels, Green Key and Blue Flag, on the other hand, have a focus on making human settlements inclusive, safe, resilient and sustainable (SDG 11) and on implementing tools for monitoring sustainable development impacts for tourism (SDG 12.b). - “Ensure healthy lives and promote well-being for all at all ages” (SDG 3). - “Ensure inclusive and equitable quality education and promote life-long learning opportunities for all” (SDG 4). - “Protect, restore and promote sustainable use of terrestrial ecosystems..” (SDG 15). - “Promote sustained, inclusive and sustainable economic growth..” (SDG 8), particularly to “..Implement policies to promote sustainable tourism which creates jobs, promotes local culture and products” (SDG 8.9). - “Make cities and human settlements inclusive, safe, resilient and sustainable” (SDG 11). - “Ensure sustainable consumption and production patterns” (SDG 12). - “Take urgent action to combat climate change and its impacts” (SDG 13). - “..Promote sustainable use of terrestrial ecosystems..” (SDG 15). 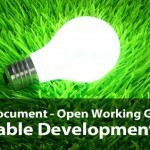 - “Promote peaceful and inclusive societies for sustainable development..” (SDG 16), particularly to build transparent institutions and promote non-discriminatory policies for sustainable development (SDGs 16.6, 16.b) with a positive, proactive, democratic modus operandi and a strong synergic support to civil society and third sector. - “Strengthen the means of implementation and revitalize the global partnership for sustainable development” (SDG 17) through a geographically spread, multi-stakeholder approach. a) YRE: Young Reporters for the Environment is a network of international youth engaged in environmental journalism and Education for Sustainable Development, where the students investigate an environmental problem and report it to the local community, while, at the international level, they may cooperate with young reporters from other countries for sharing information or data, with the aim of proposing a solution and disseminating it. “Ensure inclusive and equitable quality educationand promote lifelong learning opportunities for all” and its subparagraphs“..increase … the number of youth and adults who have relevant skills, including technical and vocational skills, for employment, decent jobs and entrepreneurship” (SDG 4.4) with the aim of learning to think critically, “ensure all learners acquire knowledge and skillsneeded to promote sustainable development, including among others through education for sustainable development and sustainable lifestyles, human rights, gender equality, promotion of a culture of peace and non-violence, global citizenship, and appreciation of cultural diversity and of cultures contribution to sustainable development” (SDG 4.7) for being able to connectwith concrete issues. The environmental educational programme thus also wish for taking “action to combat climate change and its impacts” (SDG13), specifically for what concerns to “improveeducation, awareness raising and human and institutional capacity on climate change mitigation, adaptation, impact reduction, and early warning” (SDG 13.3) through active solution-oriented learning. The programme canalso help to“promote mechanisms for raising capacities for effective climate change related planning and management, in LDCs, including focusing on women, youth, local and marginalized communities” (SDG 13.b).  “Promotesustainable agriculture” (SDG 2).  “Promote well-beingfor all at all ages” (SDG 3).  “Achieve gender equality and empowerall womenand girls” (SDG 5). b) ECO-SCHOOLS: A global student-led change process in Education for Sustainable Development which involves also teachers’ training, integration in the school curriculum, environmental reviews, action plans, monitoring and evaluation, informing and involving the local community, setting an eco-code focusing on the various environmental themes (water, energy, waste, global citizenship..).  “Strengthen the means of implementation and revitalize the global partnership for sustainable development” (SDG 17).  “Promotepeacefuland inclusivesocietiesfor sustainable development… and build effective, accountable and inclusive institutions at all levels” highlighting the theme ofsocial justice(SDG 16). c) LEAF: Learning About Forests wants to encourage environmental education through awareness raising among students, teachers and the wider school community, to increase knowledge about the key role forests play for sustainable life on our planet, reflecting their cultural, ecological, economic and social functions, with themes as biodiversity, climate, products or services, codes and myths.  “Strengthen the means of implementation and revitalize the global partnership for sustainable development” (SDG17). d) BLUE FLAG: The world’s biggest voluntary eco-label for beaches, marinas and eco-tourism boats works towards sustainable development through compliance with criteria dealing with environmental education and information, environmental management, water quality, safety and other services.  “Protect, restore and promote sustainable use of terrestrial ecosystems… halt and reverse land degradation and halt biodiversity loss” for halting the loss of biodiversity and preventing the extinction of threatened species, also through the integration of ecosystem values into local planning policies (SDG 15). e) GREEN KEY: This eco-label for tourism facilities (hotels, campsites, small accommodations, tourist attractions and restaurants) is a voluntary award that aims at contributing to prevent climate change and reach sustainable tourism by awarding and promoting best practice, with the goal of changing the environmental practices at the awarded establishments but also the behaviour of tourism actors, including guests, staff, suppliers, authorities, local communities so to involve them in increasingly safeguarding their own environment. The focus is on themes such as environmental management, water, waste and energy saving, involvement and awareness of guests and staff, management of food and beverage and open spaces.  “Ensure sustainable consumption and production patterns”with rules for achieving sustainable management of natural resources,respecting eco-criteria for food and beverages, reducing waste generationand achieving environmentallysound management of chemicals (SDG 12).  This way the programme “develops and implements tools to monitor sustainable development impacts for sustainable tourism which creates jobs, promotes local culture and products” (12.b).  “..revitalize the global partnership for sustainable development” (SDG 17).